A powerful super villian/eco-terrorist named Thanos sends his cronies to acquire the remaining infinity stones while our heroes try to stop him. That’s it. After this movie the term ‘action-packed’ will never be the same. Cramming nearly every Marvel hero into two-and-half hours means non-stop quips and fights. As such, the actual storyline is extremely thin and simple, but the investment in the characters we’ve built up over the past ten years ensures you’ll cheer, laugh and gasp regardless. 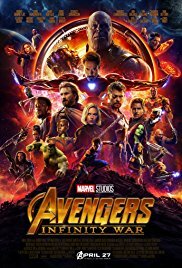 The sheer number of potential spoiler moments in this movie makes it difficult to write about, but if you’ve enjoyed any of the Marvel films, rest assured you’ll love this ‘roided-up herofest. It’s a delightful romp that is a culmination without being a finale.